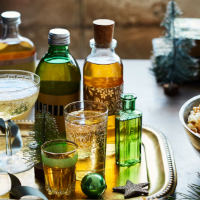 A twist on classic limoncello, this tipple is full of the scent of Christmas. It’s delicious served chilled on its own, or added to zz for a festive cocktail. 1. Wash the clementines and cut each into eight. Remove the flesh from each piece (set aside to eat at a later time). Using a sharp knife, carefully trim away the white pith from the peel. 2 . Put the peel in a new, large sterilised jar and add the vodka and spices. Leave to infuse for 5 days. 4. Strain the vodka and add the sugar syrup. Pour into new sterilised bottles and decorate for gifts. You can add a few spices to each bottle if you like. This is best drunk within 3 months. This recipe was first published in Fri Oct 13 13:18:16 BST 2017.